This morning, the Washington Post featured another long article on the use of hyperbaric oxygen chambers. This was on how the Washsington Nationals' relief pitcher, Rafael Soriano, uses his chamber through the season to keep himself young and healthy. "When I was younger, I didn't train like this," he said. He feels he is less likely to be injured, and recovers more quickly, particularly as the season goes on. Here's a photo, courtesy of the Washington Post. His chamber is about 7.5 by 4 feet, and is inflatable via remote-controlled air pumps. While he's in it, for about 90 minutes, he can watch DVDs or text friends. The article also mentions other athletes, both football baseball players, who use their hyperbaric chambers to get up for games, or, in many cases, to ward off or recuperate from injuries . . . thereby lengthening their careers. Oh yes, the price-tag. About $20,00--a good investment if it gives you another year or two with major-league. Curious what the other most-read articles on my blogs have been? A poair of posts on the so-called "Michael Crichton Conspiracy" that someone has put out onto the web a few years ago. 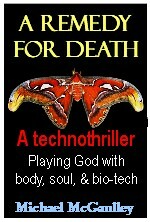 Crichton's thrillers were among my long-time top-favorites, so I posted it. And there's been hardly a day someone from around the world hasn't checked one or both of those pieces. Rather than linking them,t, I'll just reblog the two original articles to this blog. I posted here a couple of items on hyperbaric oxygen therapy a year ago, and since then they have been among the most visited on this A REMEDY FOR DEATH blog, so let's check in on a new report on studies on the use of hyperbaric oxygen therapy as a method for helping to repair brains damaged by stroke, injury, or war wounds. My second post on hyperbaric oxygen therapy " Hyperbaric oxygen chambers-- another use, this by Olympic swimmer Michael Phelps" focuses on other uses of oxygen therapy to improve human performance. As I wrote then, "What's particularly interesting to me is that for healing purposes, patients enter the hyperbaric chambers and go as if underwater, where air pressure is heavier. Phelps and other athletes do the opposite: instead, they use the tanks set to simulate going up where the air is thinner. That simulated altitude changes the body make-up, stimulating the growth of red blood cells." Now on to what's new in the field of hyperbaric oxygen therapy: an report by Kayt Sukel in the blog of the Dana Foundation, "Can hyperbaric oxygen repair the damaged brain?" It reports on studies at three different institutions, one in Florida, one in Israel, and the other the U.S. Air Force. I won't try to summarize it, better to read it yourself. Oh, and by the way, were you wondering what hyperbaric oxygen therapy has to do with my book, A REMEDY FOR DEATH? My best suggestion is to read the book, as it gets into the use of hyperbaric oxygen tanks, bio-artificial organs, human stem cell implants, organ regeneration, regenerative medicine, the human mind . . . and how some elites have too much money and how they want to use all that dough to buy themselves (to repeat myself!) a remedy for death. We recently examined here the use of hyperbaric oxygen chambers as a tool to aid recuperation from slow-to-heal wounds and other health conditions. Link to that blog post: "Hyperbaric oxygen chambers--- nowadays not just science fiction." That was in the context of the role hyperbaric oxygen chambers play in my medical techno-thriller, A REMEDY FOR DEATH. Today I came on another use of hyperbaric chambers, this in both USA Today and in more detail in Toronto's Globe and Mail. American Olympic swimmer Michael Phelps 16 medals), has been "sleeping at 8,000 feet every night," in a hyperbaric chamber. What's particularly interesting to me is that for healing purposes, patients enter the hyperbaric chambers and go as if underwater, where air pressure is heavier. Phelps and other athletes do the opposite: instead, they use the tanks set to simulate going up where the air is thinner. That simulated altitude changes the body make-up, stimulating the growth of red blood cells. And bear in mind the rumor that singer Michael Jackson slept in a hyperbaric chamber to slow the aging process. Dr. Timothy Adkins (mentioned in my previous post, above) pointed out that he could not have slept all night in a chamber set to simulate underwater pressure: that would have resulted in damage and possible convulsions. But --- and it is still a rumor, bear in mind --- perhaps Mr. Jackson, like Mr. Phelps, slept in a hyperbaric chamber set to a thinner atmosphere, as if on a mountain. Who knows? Hyperbaric oxygen chambers--- nowadays not just science fiction. Science fiction that's not fictional, technology that probably seemed far-out a couple or so decades back but is everyday use now. I'm referring to hyperbaric oxygen chambers. As hyperbaric chambers and hyperbaric oxygen therapy play key parts in my medical techno-thriller, A REMEDY FOR DEATH, I took advantage of an opportunity recently to visit (as an observer, not a patient) the Center for Wound Care & Hyperbaric Medicine, a part of the Sebastian River Medical Center in Sebastian, Florida. I came away with some photos and info I hadn't previously known, and thought this would be a good place to share as background to readers of A REMEDY FOR DEATH. The primary objective in using hyperbaric oxygen therapy for a patient is to increase the concentration of oxygen in the blood, as a way of promoting healing. For that reason, a lot of the patients attending the Sebastian Center for Wound Care & Hyperbaric Medicine suffer from diabetic wounds or other injuries that have bneen slow to heal. Put them in a chamber, pump up the concentration to maybe two atmospheres or so (around what you'd be experiencing as a scuba diver 30-50 feet underwater), then increase the oxygen to 100% from its normal range when mixed with outside air, and healing significantly speeds up. Though, to qualify that, it may take 10, 30 or more sessions in the tank for the desired breakthrough. While in that "dive," the patient lies on a comfortable bed, and can read or watch TV. (But definitely not smoke! Remember how bad things happen when pure oxygen and flames, or even sparks, get together.) For that same reason-- to avoid any chance of a spark -- the maintenance staff uses special mops and solvents. Here's another shot of a hyperbaric chamber, this time with the hatch sealed. The tanks used here are open and bright, so patients don't risk the claustrophobic sense in other "tubes" such as MRI. I said the primary objective in using hyperbaric therapy is to speed healing, that is, helping tissues knit together more rapidly. But there are other uses, including to help the recovery of victims of stroke or Traumatic Brain Injuries (TBI). It seems that most of the more visionary experimental work has to be done outside the United States, because of our slow-to-change regulatory mode. There was a rumor that singer Michael Jackson slept in a hyperbaric chamber in the hopes of staying young. Rumor or true, who knows. But there is research being done on that now--- can hyperbaric oxygen therapy slow aging? My thanks to Timothy G. Adkins, M.D., Medical Director at the Center for Wound Care & Hyperbaric Medicine, part of the Sebastian River Medical Center, Sebastian, FL. Oh, as to the question, What does it feel like to be in a hyperbaric chamber breathing oxygen? According to Dr. Adkins, it doesn't feel any different than breathing normal air at normal pressure. Have a heart? Don't let it break. Now they can recycle it! The exercise pill! A synthetic biology triumph in the making! A bio-engineered ticket to the Fountain of Youth! "Have scientists found the key to eternal life?" -- Are worms showing us the way to radical life extension by reversing the aging process? If you were redirected from TheLifeAfterDeathConspiracy,com, you'll find all of that content plus a lot of new material. Welcome!